It had been a long winter. The cold, icy months were a fickle mistress, but at last Spring, the bright-eyed child of Summer had driven the insatiable, bitter season away. Sweet rain fell over the mountains even as rays of golden sun streamed through breaks in the clouds. Elated to be away from the town, Eruviel had stashed most of her attire in the hollow of an old tree before disappearing into Far Chetwood. The legs of her trousers rolled up to her knees, she sported a short sleeved blouse that had been borrowed from Anyatka’s dresser. 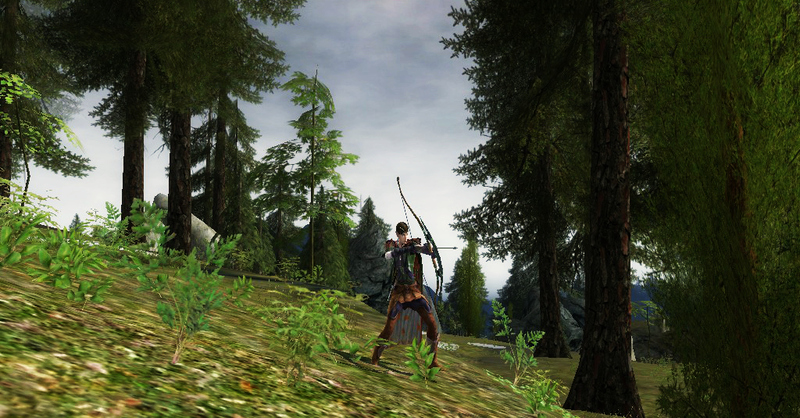 Eruviel carried only her dagger at her hip and her bow and three arrows on her back. The past few days had been a haze and she ached to find solace in the darker woods beyond the leafy forests. Crystals of dew coated the fresh upshots of grass and kissed her bare feet as she ran through the groves of oak trees. The scent of pine flowed down from the heights and she let it draw her forward and let it bathe and sharpen her senses. Jumping a stream she dodged a forgotten trap, throwing a rock behind her to spring it as she continued on. She did not know how far she had ran, and it mattered little, for the more ground she covered and the more obstacles she vaulted, the faster she desired to go. Studying a cliff that loomed before her, a light wind picked up from behind and she began to climb. Higher. The wind wrapped its ethereal arms around her as she leapt up from her perch to grab the only available hand hold and swung herself onto a ledge. Higher. Her keen elven senses reveled in the beauty and danger of her surroundings. She loved the climb and the destination, but she also loved the thrill of the decent that came after. Even Milloth used to climb down with care. A tremor of excitement rushed through her as she swung herself up, grasping at stones, roots and cracks in the granite. Though she had enjoyed the storms of winter, she had missed the wilds during the months she was bound to Bree or the long dangerous road. Danger; that was another thing she seemed to be unable to avoid. But the more she abandoned her care of survival, the better she seemed to survive, and the more she felt alive. Eruviel chuckled as she reached the top of the cliff and pulled herself up over the ledge, the faces of those closest to her flashing in her mind as she hung precariously. How they’d cringe. She jokingly chided herself for binding herself to the humans she cared for, but always the answer was simple, and she felt almost as much joy at seeing them again as she felt when out on her runs . . . almost. Standing on the edge of the precipice she drank in the scenery. Sunlight danced across the velvet quilt of the land below. Smoke rose now an then, and she could only imagine the feasts and battles that must have been occurring in the light of the fires. Clouds sailed the space between, and she let her mind wander to fancies as the whistling of the wind and sounds of the stone, forests and birds complimented one another in a melody she wished could be expressed through a harp and lute. Eruviel sat on the ledge, her bare feet dangling freely in the space beneath her and leaned back. Clouds carried by the currents of air swept up the mountain to engulf her, leaving her glistening with dew in the warm mid-day sun.. Putting her arms beneath her head she closed her emerald eyes, wishing the perfect moment atop of the world could last forever.